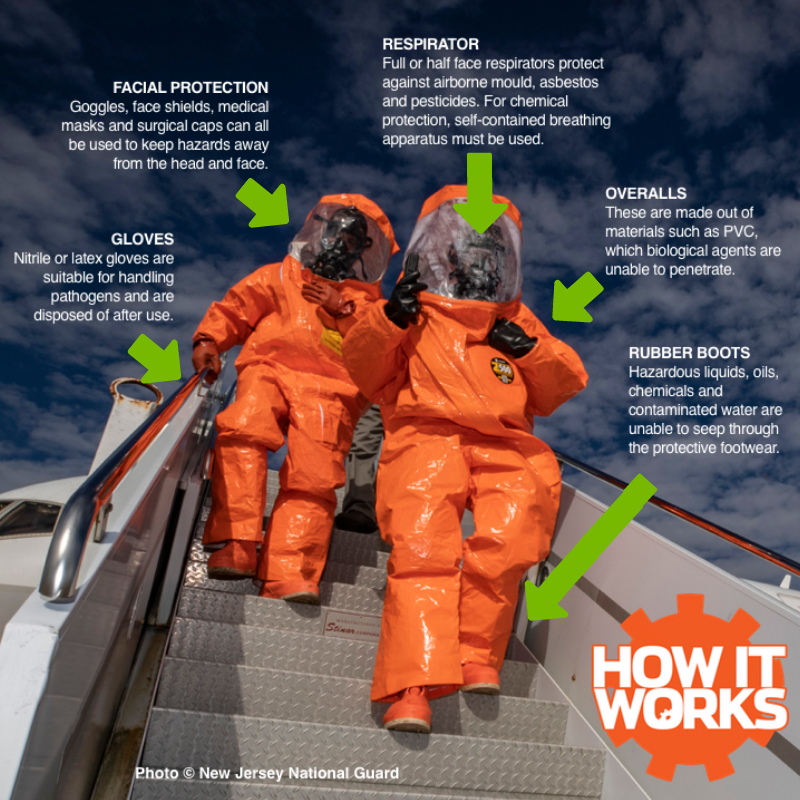 How do hazmat suits work? For every weapon forged there is a piece of armour made to defend against it. For swords it was chainmail, for bullets it was Kevlar, and for chemical agents it’s the hazmat suit. Short for hazardous materials suit, this piece of kit is built to defend us both on and off the battlefield by shielding us from harmful liquids and gases. Hazmat suits are barrier formed of plastic, fabric and rubber, along with an independent source of oxygen. They protect workers by separating them from their hazardous environment. Simpler suits can be slipped on to protect against harmful liquids, but more advanced suits can become completely airtight to defend against airborne contaminants and toxic chemicals. This versatility has meant that hazmat suits can be used by the military, in industry and by healthcare workers. In the unlikely event of chemical warfare, a hazmat suit could be the difference between life and death. Workers operating in waste disposal also make daily use of hazmat suits, and they’re used by staff in nuclear power stations to ensure they don’t carry any radioactive contaminants home at the end of the day. Recently, nurses and carers treating patients infected with the Ebola virus in West Africa wore hazmat suits to protect themselves against airborne infection. These examples are just a few of the many ways hazmat suits can keep us safe by protecting our skin, eyes and respiratory system from harm. The term ’hazmat suit’ covers a wide spectrum of protective clothing. Anything capable of blocking hazardous materials may be labelled as a hazmat suit. However, a brewer working with a liquid disinfectant would be dressed quite differently to a scientist handling toxic gases. So to ensure the appropriate amount of precaution is taken, hazmat suits are arranged into four different types. Type A suits are fully concealed from the outside and equipped with a self-contained breathing apparatus. By ably defending against biological and chemical hazards, these are the go-to choice when working in highly dangerous atmospheres. Type B suits are not airtight but retain breathing equipment. These can be used when handling gases that aren’t harmful to the skin. Type C suits are often worn when working with general biohazards, and a simple respirator is worn. Finally, Type D suits would be worn by our brewer, and could simply include a protective apron, boots, glasses and long gloves. Next story What is sand made of? Previous story Cyber Monday: Last chance to get 20% off a year’s subscription to How It Works!